Hollow fill for a break apart dessert or solid fill for a centerpiece for your hunting weekend. 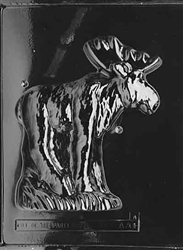 The Jumbo Moose Mold is so large it makes a huge impact on your event. Use with Piece 2 to make a wonderful 3D centerpiece. Each piece is 8-1/4" x 7" x 2"